Fork and knife use: Americans need to stop cutting and switching. The American way of using fork and knife is inefficient and inelegant. We need a new way. Does your fork switch hands after cutting? You have nice table manners. For an American. Turns out I don’t zig-zag. Fffwhat’s that? Zig-zag is etiquette doyenne Emily Post’s term for it, but we could also call it the Star-Spangled Fork-Flip, the Freedom Fork-Over, or the Homeland Handoff. Or the cut-and-switch. See, when using both a fork and knife, Europeans (and everyone else, basically) will keep the fork in their left hand and the knife in the right as they cut and eat their food. But the traditionally well-mannered American? After he cuts a piece of amber-waves-of-grain-fed steak, he’ll lower his knife to his plate. And then he’ll switch the fork (USA! USA!) to his right hand to convey the food. Do you cut-and-switch? Well, you’ve got to stop. The more time you waste pointlessly handing utensils back and forth to yourself, the less time you’ll have to cherish life and liberty, pursue happiness, and contribute to America’s future greatness. And also—though that snob at dinner surely didn’t know this—the supposedly all-American cut-and-switch is in fact an old European pretension, of just the sort we decided to free ourselves from 237 years ago. Yup. The cut-and-switch is originally European. According to Darra Goldstein, a professor at Williams College and the founding editor of Gastronomica: The Journal of Food and Culture, when forks first came to the European dining table, diners took their cues from the kitchen, where the fork would be held in the left hand to steady a slab of meat, say, and the right hand wielded the knife. So far, so good. 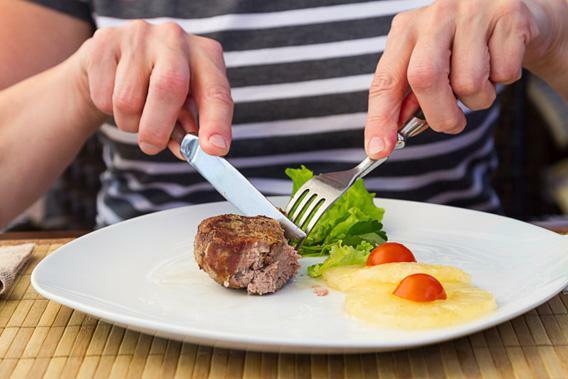 But around the early 18th century, particularly in France, it became fashionable for diners to put the knife down after cutting, and swap the fork to the right hand—i.e., to cut-and-switch. Nineteenth-century Americans acquired the cut-and-switch from France—“the arbiter of elegance” for Americans then, says Goldstein. But by then Europe was already changing. In 1853, a French text claimed it was trendy to not cut-and-switch. Again, there may be no good reason. Bethanne Patrick, author of An Uncommon History of Common Courtesy, told me she suspects convenience and efficiency eventually won out, hastening the adoption of the no-switch style we now call Continental or European—and then that, too, took on the force of fashion. The other reason to dump the cut-and-switch, of course, is that it’s a European pretension—one so weird that even Europe eventually abandoned it. And please, no “wherever it came from, it’s American now” business. Let’s be clear—this was a French norm swallowed whole by Americans who reflexively equated France with classiness. And we’re the ones who pride ourselves on our casual willingness to cast off the mooring lines of tradition. Clinging to a complicated and encumbering Old European mannerism whose purpose is utterly opaque? Is that why we had a revolution? Luckily, change is afoot. Some Americans—those who have lived abroad, those with a foreign parent or two, particularly bewildered left-handers (check, check, and check)—have never cut-and-switched. But these days I encounter more and more Americans who’ve unshackled themselves from outdated cultural hegemonies. The experts have noticed too. Anna Post stressed that while both methods remain equally acceptable, her “sense is that the American style is slowly becoming outdated.” Bethanne Patrick told me much the same. Cesar Caicedo is a captain at Tom Colicchio’s New York restaurant Craft, the home of what might be the world’s best roast chicken. He’s noticed a gradual but unmistakable change over his nine years there. As a typical example, he described a recent large graduation dinner he worked—Texans, not New Yorkers—at which only the grandmother ate American-style. A move toward relaxed simplicity, of course, isn’t just typically modern—it’s typically American. We’ve simplified global manners (dress, food, communication) again and again. So giving up the cut-and-switch is arguably more “American” than keeping it—it’s simpler, easier, more relaxed and less fussy. It’s telling that Caicedo, Patrick, and Post all attributed the decline of the cut-and-switch to a larger trend toward simplicity and ease—not a desire to seem more European. The best evidence that Americans who eat Continental are riding an American, not a European wave? We’ve bastardized Euro-manners to make them still more convenient. Many Europeans stubbornly deploy their forks tines down—either as a spear, or, if the food isn’t stab-able, as a surface on which to awkwardly pile or smoosh food (awkward piling is particularly English—“How many peas can dance on the back of a fork?” asks Kate Fox, in Watching the English). But the pragmatic Americans who’ve abandoned the cut-and-switch almost always use the fork tines-up—i.e., as an efficient shovel—whenever it’s convenient to do so. This hybrid style of eating is how Anna Post herself eats. But America’s lurch toward such modified Continental-style eating has been worryingly uneven. Nearly everyone I spoke with associated cutting-and-switching with older Americans and Midwesterners, and no-switching with younger and coastal diners. Another culture war is just what we don’t need—especially one in which we’re all waving sharp implements, and both sides are open to plausible charges of unedifying Europhilia. Perhaps the best way to avoid open warfare is to formalize many Americans’ simplified take on Continental style (no fork-switching, but tines pointing any damn way you please) as itself an American creation—an efficient, relaxed blending of old and new worlds. What we do need—especially if we’re hoping to add this version of table manners to our still-impressive list of cultural exports—is a good name. We could christen this mode of manners Post Modern, after Anna Post herself. But that might get confusing. How about American Modern. Simple and clean, like the style itself, and the perfect finish to what we started in 1776.